Cover illustration: Except for Yucca endlichiana, most yuccas are not very succulent, but they have the stiff, sharp-outlined silhouettes of many succulents and can certainly be considered xerophytes. Our cover photo, taken by Carol Wujcik of Fountain Valley, California, was a prize-winner in the national show of the CSSA at the Huntington Botanical Gardens last June. 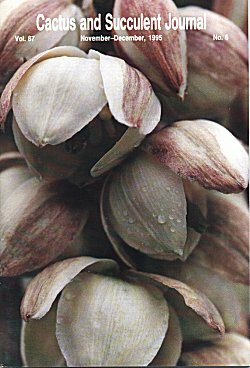 We have tentatively identified the species as Y. glauca because of its reddish-tinged, almost globose flowers.